Volunteers play a critical role after a disaster, from recovering the dead to helping survivors deal with physical and emotional distress. As we mark International Volunteer Day, we acknowledge the selfless dedication and commitment of volunteers here in Nepal and elsewhere. Volunteerism in emergencies can set the stage for increased recognition of volunteerism globally. Momentum has been gaining, but there is still a lot to be done particularly because volunteer work is not a 9-to-5 job. During emergencies, it is work that takes place in dangerous territory often among grave insecurities. Volunteers play a critical role in rescue operations after a disaster, from recovering the dead to helping survivors deal with physical and emotional distress, and restoring essential services such as water and power. It requires persistence, physical and psychological strength, as well as a strong dedication to each task. That alone deserves to be recognized, particularly because volunteers do not ask for anything in return. An unprecedented number of people across the globe are in need of life-saving humanitarian support. Volunteers are at the forefront of efforts to support people in times of crisis; that was evident during the recent floods in South Asia, as it is in South Sudan, Syria, Somalia and elsewhere. Groups and individuals from all backgrounds are standing up to face these challenges. They are not just effectively responding to humanitarian emergencies everywhere; they are doing it with the motivation to alleviate suffering and to uphold human dignity. On this year’s International Volunteer Day, volunteer organizations will celebrate the contributions of such volunteers at the local, national and international levels together with civil societies, youth organizations, government and international organizations including the UN. In Nepal, we know that volunteerism draws on strong cultural and historical traditions. After the earthquake in 2015, nearly 8,000 Red Cross volunteers worked around the clock to provide urgent assistance. 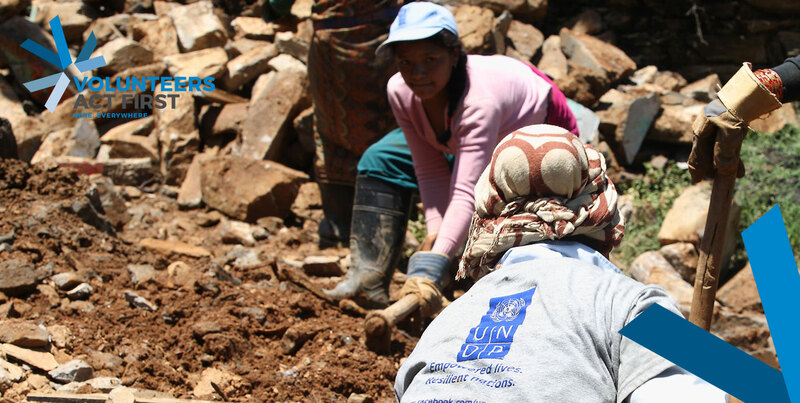 Thousands more Nepalis did likewise and supported relief and recovery efforts through voluntary action. The UN family as well swiftly mobilized UN Volunteers across agencies to deliver the most important services needed. They cleared debris from roads to allow the use of infrastructure and drastically lowered threats to the public that lived with frequent aftershocks that led many damaged buildings to fully collapse. The UN Volunteers also handled information, coordination and rumor tracking, essential to identify the needs of vulnerable groups and leave no one behind. During the 2017 floods in the Tarai, we again witnessed dedicated and selfless human efforts that can only be described as pure altruism. It was the small groups, the neighbors, the networks connected through social media, chat-apps and occasional gatherings, that bring first response together with well-established organizations. Volunteers play a vital role on the frontlines of disasters, saving lives, providing relief materials and services, and looking out for those who need help the most. With increasing vulnerabilities from natural disasters, volunteer action is required more than ever. Volunteers are ordinary people, often struck by the same tragedy as their neighbors, family and friends. They are the ones who act first to face the challenges in front of them. It is our task to give a helping hand to volunteers in Nepal so they can continue the hard work they are doing. In Nepal, there is the National Development Volunteer Service (NDVS) where Nepali citizens can sign up and volunteer for communities. NDVS regularly deploys volunteers who focus on agriculture, health, engineering and other sectors. Over 10,000 volunteers have served in NDVS since it was established, and it aims to provide more opportunities. Whether it is through the Volunteer Sending Agencies, the Nepal Red Cross Society, or the UN and its partners, we as the international community join hands and aim to provide many platforms for volunteers to enhance their engagement. We are here to continue a meaningful dialogue to uplift volunteers, share their stories and turn these regular people into the heroes they truly are. This op-ed was originally published in the Nepali newspaper myRepública. Olivier Adam is the Executive Coordinator of UNV. Valérie Julliand is the United Nations Resident Coordinator and UNDP Resident Representative in Nepal.